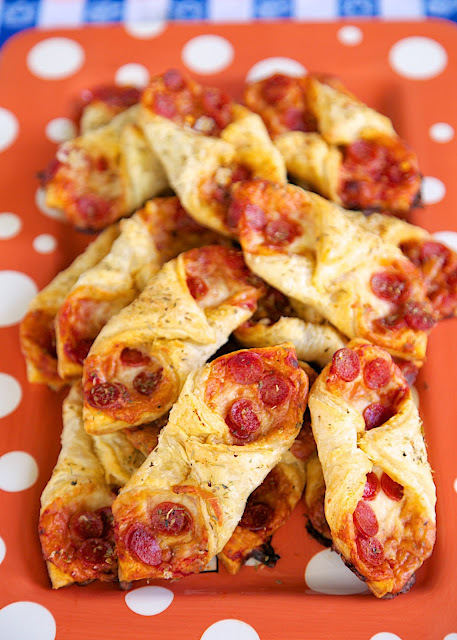 Pepperoni Pizza Pastry Puffs - two bite pizza! Only 5 ingredients and ready in 15 minutes! Perfect for parties and tailgating. We also like to eat these for a quick lunch. Whenever I take these to a party, there are never any left!! Can assemble and freeze for later. It's that time of year again, FOOTBALL SEASON!! My absolute favorite time of year! I love watching football, but I especially love the tailgating! Every Friday, from now until the Super Bowl, I will be sharing a new and delicious tailgating recipe. 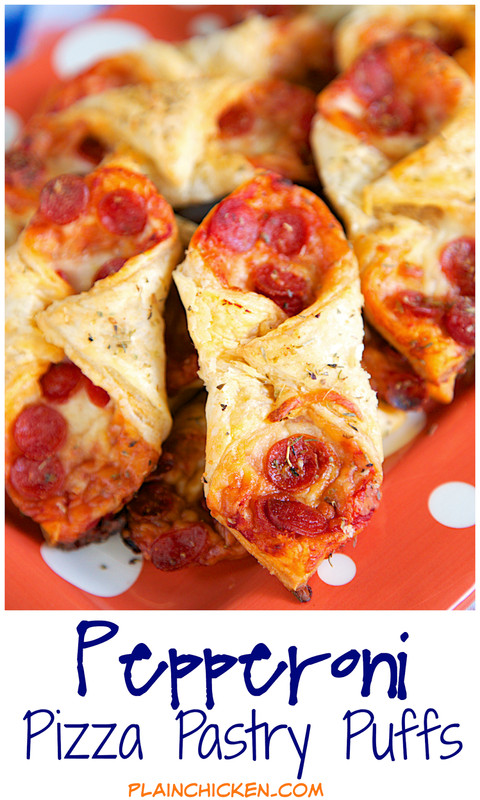 All the recipes are quick, easy and perfect for football watching parties. 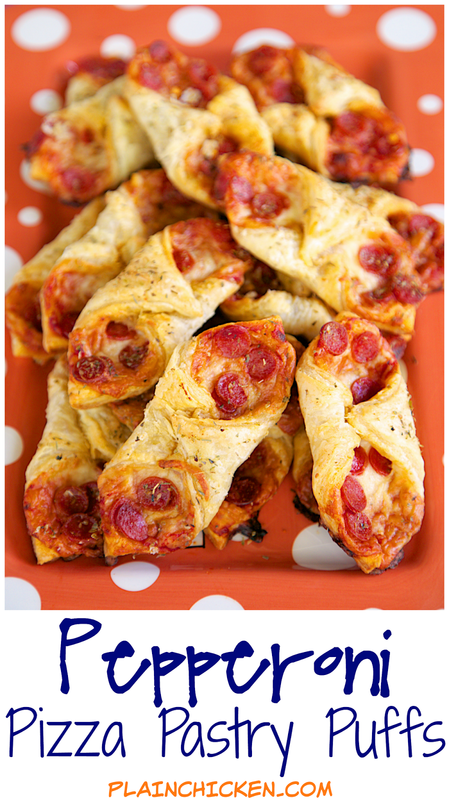 Today's recipe is for Pepperoni Pizza Pastry Puffs. They are two bite pepperoni pizzas, and oh, SO good! 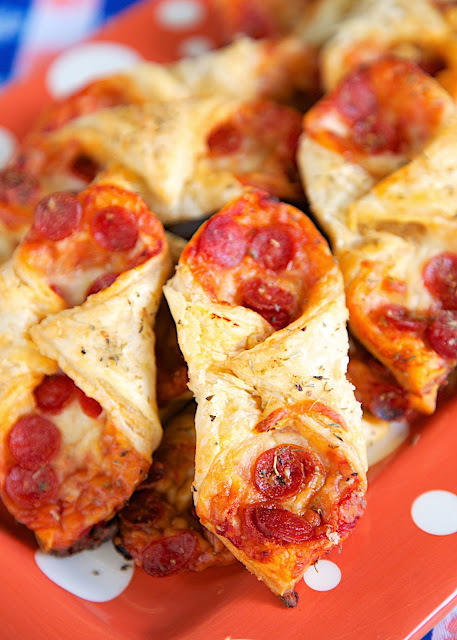 Puff pastry topped with sauce, cheese and pepperoni. We've made these a few times and they are always a hit. There are never any leftovers. I also like to eat them for lunch. If you want to make these ahead of time, you can assemble these and freeze unbaked for later. Just thaw and bake as directed. Spread about 1 Tbsp of pizza sauce over the puff pastry. Arrange cheese and pepperoni down center of the pastry squares. Sprinkle with some of the Italian seasoning. Fold two opposite corners of each square over the filling and press edges to seal. Place on prepared baking sheet. What an easy quick thing I can make with my kids...all three of them could do this (13, 12 & 2) thanks for sharing! This looks great for tailgating or just a day out with the family. These look "labor friendly" - thanks for sharing.